What did precious metals do in 2018? 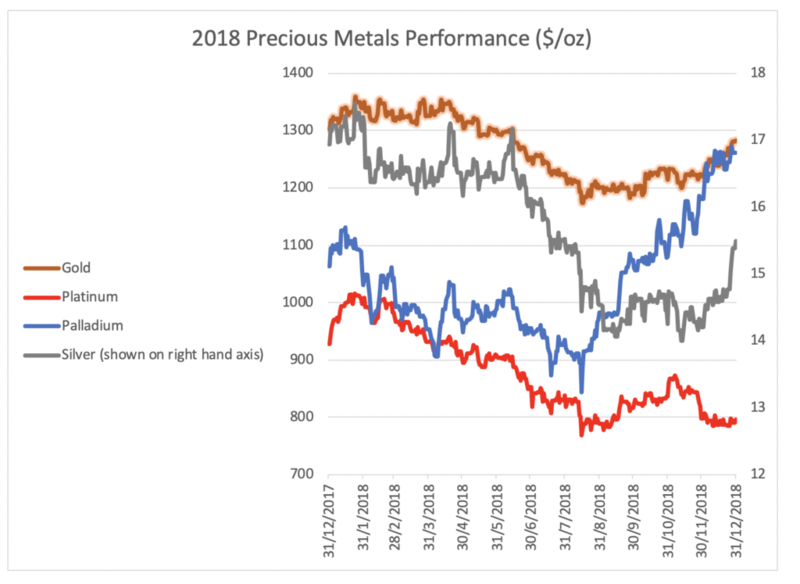 Did precious metals perform well in 2018? As everything in life, it depends on perspective. 2018 was a mixed year for precious metals. While the price of gold held steady, down just 1.6% to $1,282 per ounce versus $1,303 at the beginning of the year, silver fell by 8.5% from $16.9 to $15.5 per ounce. Platinum had an even sharper decline of 20.6%, ending the year at $796 from $928 per ounce. The main winner within the precious metals complex was palladium, which rose 20.6% to $1,282 per ounce from $1,064. However, when compared to the performance of most international stock markets, precious metals actually fared quite well. For example, when converted into US dollar terms, Argentina’s market crashed by 50% and Shanghai by 29% in 2018. Even the advanced economies suffered strong market declines, with the German DAX index down 22% and the Japan Topix index down 16%. So, in that context, gold, silver and palladium were a better place to put your money than the stock market. Looking at the chart above, we can see that precious metals began the year with a lot of momentum. However, they sold off during the late summer and recovered losses in the later part of the year. While there is a myriad of factors at play, the main driver of weakness came from the political and economic volatility in many Emerging Markets. Countries such as Argentina and Turkey saw their currencies plummet as international (and local) investors fled their markets. Capital sought refuge in the safety of the US dollar by selling down their holdings of alternative assets, such as precious metals and Emerging Markets securities. The panic in Emerging Markets began to reverse in the Fall as international and domestic politicians and organizations worked hard to restore confidence. Other factors supporting the rally in precious metals towards the end of last year was the market’s view of activity by the Federal Reserve in the United States. Investors have generally been concerned by the end of Quantitative Easing and the rising interest rate environment in the United States. However, expectations about the future path of US interest rates began to fall as some economic data disappointed, along with concerns over global trade tensions and the impact of the US mid-term elections. Consequently, investors can expect a lower return on risk-free US assets and need to look elsewhere for performance. Other factors impacting precious metals included the bursting of the crypto currency bubble. Bitcoin fell by an astonishing 74% in 2018, and many of its peers fell even more, as investors lost confidence in the long-term prospects for digital assets. For the precious metals, supply and demand dynamics were also important. Silver production fell for the first three quarters which helped support the price. Demand for gold and silver both stayed strong as a safe currency alternative to dollars for countries such as India, Turkey, Russia and China. In the case of palladium, supply constraints for the metal, which is used in the automotive industry, also helped push up the price. Looking ahead in 2019, the outlook for precious metals is positive. The pace of interest rate increases in the US and Europe is likely to slow. China is actively lowering interest rates to support its economy. The value of the US dollar versus other currencies peaked in November of last year and now appears to be on a weakening trend. This should provide a good environment for precious metals to not only outperform equities, but to register healthy absolute gains.